Studies show that differentiation is teaching with the students in mind. 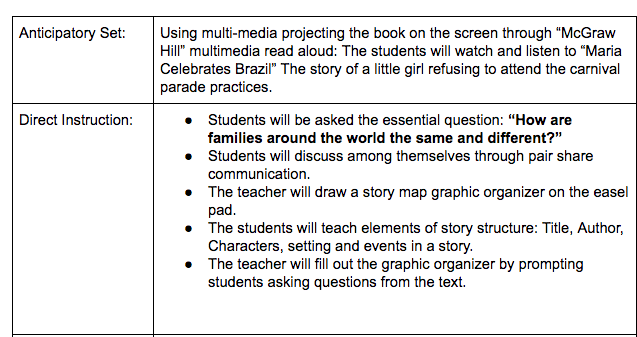 Differentiation is meeting the students where they are at, but also using appropriate curriculum to convey knowledge. (Carol Tomlinson, Differentiated Instruction) When students work at their level and scaffolding is provided, students achieve at higher levels. CASSP studies are showing that Math and English Reading scores are decreasing. Collaboration and peer interaction is another form of scaffolding as students learn from each other and help each other access content. Another way to differentiate is through providing clear expectations, necessary tools and materials which can be a scaffold for students to perform group or individual tasks. Students were given a pretest, lessons, and a post-test. A series of 5 mini lessons on how to collaborate were provided after the pre test. Each activity including mini lessons was 30 minutes. Students were divided in heterogenous groups. The emphasis was on differentiation through collaboration. 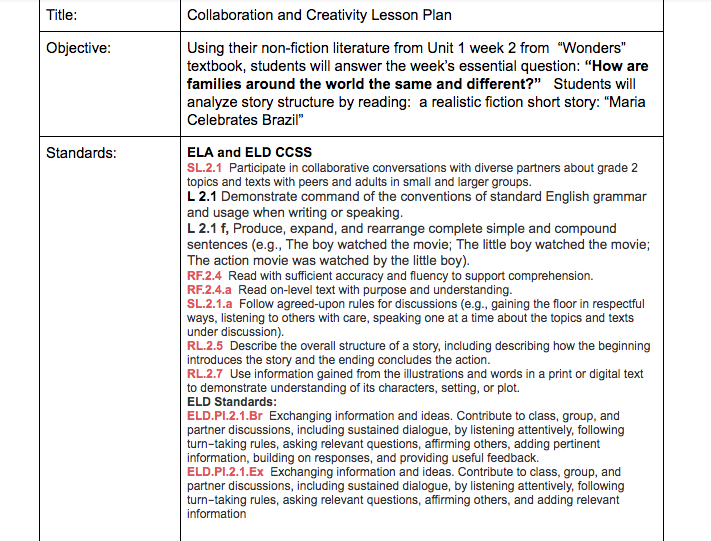 The lessons were in for English Language Arts compare and contrast, and story structure as well as five assignments were conducted in Spanish for Spanish Language Arts. The standards and skills were transferrable, so the task was similar, but the content was different. The pretest was given with instruction on what the assignment was and the tools needed for the task were provided. However, instructions on how to collaborate were not given on the pretest. Students had a hard time carrying out the assignment. Some students were not engaged, and others had a hard time figuring out who was doing what. Several lessons were taught on how to collaborate, listen to others, role play, and a t-Graph (GLAD Strategy) was made with the students to provide guidelines and expectations for collaboration. 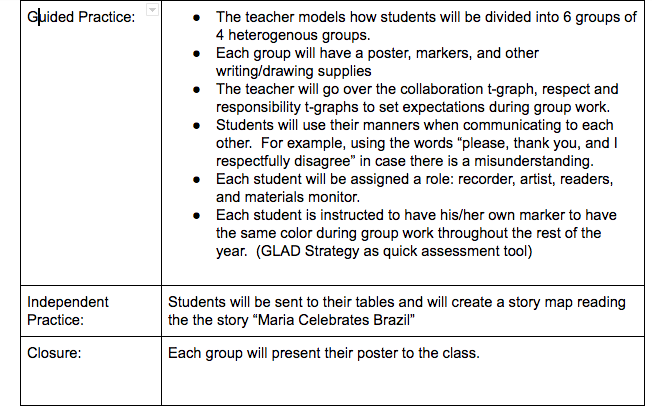 They were also instructed on how to use a Collaboration Rubric. Each day group tasks were more successful as the expectations and lessons on collaboration were thoroughly explained.